Ideal conditions and full-bloom wildflowers along single-track and double-track trails greeted the 275 racers in the third annual Pierre’s Hole 100-mile and 50-mile mountain bike races Aug. 6 at Grand Targhee. Thirteen WoodRiverValley mountain bikers enjoyed stunning views of the TetonMountains in eastern Idaho through the race. It was the eighth event in the 2011 Kenda National Ultra Endurance (NUE) series of bike races that started April 30 and finishes its 11-race schedule over Labor Day. The series includes races all over U.S. Testing the climbing legs of all racers, the challenging 25-mile loop featured about 4,200 feet of climbing per lap—meaning the 100-mile racers doing four laps exceeded 16,000 feet of climbing for the day. Posting the best 100-mile finishes of the central Idaho contingent were Sara Schroeder, Michael Shane and Greg Martin. In addition, 50-year-old Steve Butler nearly broke 10 hours. Schroeder, 26, of Hailey finished fourth among Open Women in 11.46:49. According to cyclingnews.com, she still managed to find enough energy in her legs, later, to kick up her heels on the dance floor to live music performed by Swagger, an Irish rock band from Utah. In Singlespeed, 38-year-olds Shane and Martin finished second and fifth respectively in 9.23:46 and 9.45:24. Butler was second in Men’s 50-plus with a time of 10.00:59. Open Men’s 100-mile winner was three-time defending NUE champion Jeff Schalk, 37, of Washington, D.C. in a new course record of 7.48:07. It was Schalk’s fifth victory on the 2011 NUE series, and 17th for Trek-sponsored Schalk in a 100-mile fat tire race since 2007. Schalk, from Santa Cruz, Ca., put his career as a structural engineer in San Francisco on hold five years ago and moved to the nation’s capital to be part of Trek’s East Coast team. He has been fully sponsored by Trek Bicycle Corp. since 2008. Pierre’s Hole women’s 100-mile winner, fully appreciative of being able to sleep at home in her own bed, was 33-year-old Amanda Carey of nearby Victor, Idaho in 9.12:22. She is the defending NUE series champion and current leader. Hailing from Pennsylvania, 43-year-old Gerry Pflug captured his fourth NUE 100-mile singlespeed title in just four weeks at 9.01:31. Pflug is two-time defending NUE singlespeed king and has now won seven of the last eight events. Open Women: 1—Amanda Carey, 33, of Victor, Id. (Kenda) 9:12.22. 4—Sara Schroeder of Hailey (Mud Honeys/PBR) 11.46:49 (8 finishers). 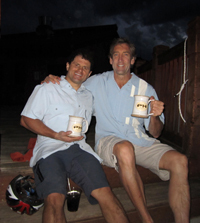 Singlespeed: 1—Gerry Pflug, 43, of Mt. Pleasant, Pa.(Salsa/No Tubes) 9.01:31. 2—Michael Shane, 38, of Ketchum (Club Ride Apparel) 9.23:46. 5—Greg Martin, 38, of Ketchum (Club Ride Apparel/Black Cat) 9.45:24 (9 finishers). Men 40-plus: 7—Bill Josey, 46, of Hailey 12.27:03. 10—Tony Buoncristiani, 43, of Ketchum 14.28:13. Men 50-plus: 2—Steve Butler, 50, of Ketchum (Team Krykei) 10.00:59. 4—Dave Bell, 55, of Ketchum 11.13:07. 6—Jim Santa, 50, of Hailey 11.17:02. DNF—Don Wiseman of Ketchum (9 finishers). Open Men: 1—Ben Aufderheide, 34, of Jackson Hole 3.49:25. DNF—John Tormey, 45, of Ketchum (22 finishers). Open Women: 1—Amy Fulwyler, 43, of Jackson Hole 4.41:34. 4—Muffy Ritz, 54, of Ketchum (Mud Honeys) 5.02:09 (12 finishers). Singlespeed: 4—Kyle Rafford, 43, of Ketchum (Club Ride Apparel) 4.39:57 (15 finishers). Men’s 40-plus: 6—Lance Levy, 48, of Ketchum 5.05:20. 8—Bill McCann, 41, of Hailey 5.08:54 (22 finishers).